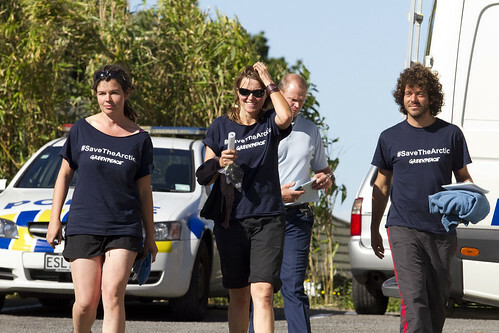 Greenpeace New Zealand has released images of Lucy Lawless, Vivienne Hadlow (both from Auckland), Mike Buchanan, Shayne Comino, Raoni Hammer (all three from Christchurch), Shai Nades (Wellington) were released from police custody and talked to the media. 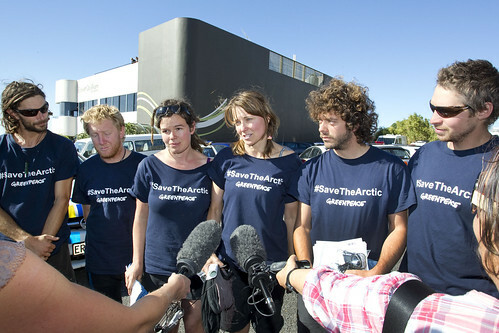 Actor Lucy Lawless, centre, the remaining five from left, Mike Ra,Viv, Shai and Shayne, outside New Plymouth's central police station, after their release on bail on charges relating to their 77-hour occupation of the Noble Discoverer. 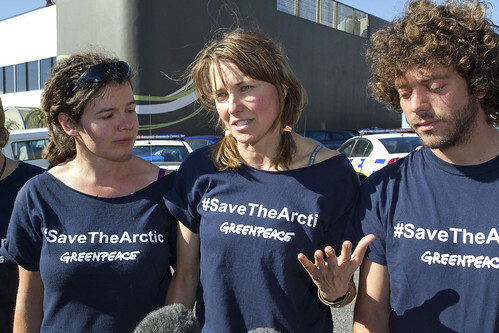 Lucy Lawless with Viv and Shai talking to media after being released from custody.